Laparoscopic adjustable gastric banding (LAGB) is the most common bariatric procedure in Europe. Despite a long list of publications about LAGB, the reports on long-term weight loss have been rather sparse. After the year 2000, more publications have documented the long-term results of laparoscopic adjustable gastric banding (LAGB). We report the long-term outcome of a large group of morbidly obese patients treated with different band-types. The main band-type was the Lap-Band® (Inamed) (952 of 984) after starting the band surgery with the SAGB (Obtech) (2 of 984). After a prospective randomized trial with the Heliogast band in 2001, we continued the use of the Lap-Band. Adjustable gastric banding has the advantages of an operation that does not open the gastrointestinal tract and can be performed laparoscopically. An argument of some surgeons and insurance companies, which restricted the use of the adjustable gastric banding (LAGB) was the lack of long-term results. We present the experience with the laparoscopic adjustable gastric banding (LAGB) since 1994 in a large group of patients. From May 1994 to June 2002, 984 patients, consisting of 647 female (77.9%) and 183 male (21.1%) underwent adjustable gastric banding (LAGB) at 4 institutions. Average age was 37.9 years (range 18-65). Average initial body weight was 127.9±23.9 SD kg, average percent excess weight (%EW) was 208±32 and average body mass index (BMI) was 46.4±7.2 kg/m2 (Table 1). 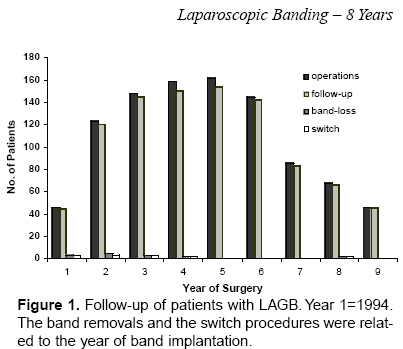 The indications for laparoscopic adjustable gastric banding (LAGB) changed during the series. Between 1994 and 1999, all patients with morbid obesity were selected for adjustable gastric banding (LAGB). Patients with body weight >200 kg and sweet-eaters were treated with intragastric balloon preoperatively (BIB, Inamed Health). The aim of this management was to lower the risk in super-obese patients and to test the compliance of patients with sweet-eater symptoms. Patients with insufficient weight loss (<10 kg in 6 months) were excluded from adjustable gastric banding (LAGB) placement. After 1999, we selected a number of patients with BMI >50 and sweet-eater symptoms for laparoscopic Roux-en-Y gastric bypass (LRYGBP) and patients with BMI >60 for laparoscopic biliopancreatic diversion with duodenal switch (LBPD-DS). In all patients, a comprehensive multidisciplinary examination including psychological tests were performed. Patients with severe psychiatric diseases were excluded from surgery, but those with a history of mild depression were accepted. All patients were further screened to identify endocrine causes of obesity. Preoperative examinations included endoscopy of the upper GI tract, lung function, EKG, chest-X-ray and blood tests. For creation of the pneumoperitoneum, the double- click technique in the left upper quadrant of the abdomen was used. We used 5 trocars with a diameter of 10 mm. In all cases a calibrated balloon- tipped orogastric tube was inserted into the stomach. The balloon was inflated with 25 cc of saline and withdrawn to the gastroesophageal junction. From 1994 to 1997, we used the retrogastric technique described by Belachew. After a prospective randomized trial, we changed to the two-step technique, which combined the pars flaccida to perigastric placement of the band. The main reason for changing the technique of band placement was to prevent posterior slippage. In all cases we created a tiny virtual pouch of 15 cc. During the first 140 cases, the gastrotensometer was used for correct band placement. After the learning curve, we performed all surgeries without gastrotensometry. In 16% of cases, hiatal hernia was detected, and a hiatoplasty was performed simultaneously. In 12% of patients, gallstones were found, and in these cases a cholecystectomy was also performed . We never performed prophylactic removal of the gallbladder. The placement of the port system was on the rectus abdominis sheath in the left upper quadrant of the abdomen. All ports, except 16 ports in the Heliogast series, were fixed with non-absorbable sutures. The first two patients in the series received the SAGB (Obtech) and numbers 3 to 881 received the Lap-Band® (Inamed). From January 2001 to May 2001, we implanted 30 Heliogast bands (Helioscopie) and 30 Lap-Bands during a prospective randomized study.2 After this period, we continued the use of the Lap-Band. Additional procedures were performed in 87 patients (8.8%): cholecystectomy in 57 patients, hiatal hernia repair in 26 patients and umbilical hernia repair in 4 patients. During surgery in cases of SAGB and Lap-Band®, no filling of the band was performed. In the Heliogast series, 1.5 cc was filled at the end of the procedure to keep the band closed. All patients were instructed to consume only liquids during the first 4 weeks after surgery. From 1994 to 1998, we performed the first adjustment in all patients 4 weeks after surgery under radiologic control. After 1998, we performed the adjustments 4 weeks after surgery only in patients with hunger sensations or insufficient weight loss. Otherwise, we waited until the weight loss decreased or hunger feelings occurred. The filling volume for the Lap-Band® was limited to 3.5 cc, but in the Heliogast series was unlimited. The computerized follow-up program includes health status and weight control. Tests for quality of life (QOL) were done by standardized questionnaires in 1997 and 2002 (SF-16, BAROS). The follow-up rates are shown at Figure 1. The data of 21 women during and 6 months after 25 pregnancies after LAGB were excluded from the weight loss calculations (375 follow-up months). In 47% of the patients, follow-up was in the outpatient obesity center and the remaining 50% by mailings or phone calls. In 24 patients, follow-up data during the postoperative period were not complete (lack of 524 months), but the last value of actual body weight during the evaluation was available. The data of all patients with band-loss and switch-procedures were available (within the follow-up rates), but were excluded from calculations for EWL and BMI. Figure 1. Follow-up of patients with Laparoscopic adjustable gastric banding (LAGB). There was no mortality and no conversion to open surgery. The mean operative time was 68 min (range 36-186). We compared the results of the first 100 patients and the following series. Previous abdominal surgery had been done in 271 patients (27.5%). The main previous surgery was cholecystectomy (54 open and 70 laparoscopic), gynecological abdominal procedures in 36 patients (3.7%) and appendectomy in 89 patients (9%). The co-morbidities and their postoperative changes are shown in Table 2. A substantial number of patients who remained on medical treatment after surgery decreased the number or the dose of the preoperative medications. Most co-morbid conditions resolved by 1 year after surgery: notably 92% of patients with diabetes no longer required medications. At 8 years after starting Laparoscopic adjustable gastric banding (LAGB), 97% of the 984 patients were able to be examined. Major complications requiring reoperations developed in 3.9% (36 patients). Early complications were 1 gastric perforation after previous hiatal surgery (requiring band removal) and 1 slippage (treated by band removal). The gastric perforation was detected 5 days after surgery by relaparoscopy; there was no radiological sign, but tachycardia and abdominal pain led to relaparoscopy and band-removal. The early slippage was caused by postoperative vomiting (case number 8 in our series); we had had no experience in band opening or repositioning at that time, so that the band was removed. Table 2. 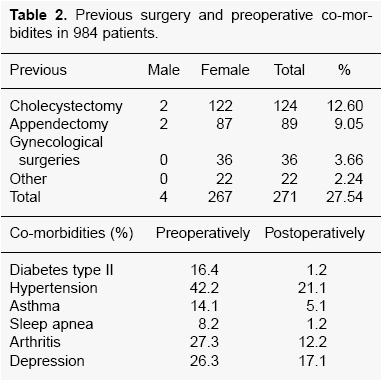 Previous surgery and preoperative co-morbidites in 984 patients. Late band-related complications were 32 slippages and 3 migrations. One band rupture (disruption of the inflatable inner surface) was seen in the Heliogast group. In 1996, we saw an aneurysmal dilatation of the inflatable part of the Lap-Band® in one case, by means of x-ray examination. The weight loss in this patient was poor, so that we carried out band exchange laparoscopically, and the postoperative weight loss was successful. The distribution of major complications are shown in Figure 2. There was obvious decrease in complications after the learning curve. Late port-related complications were 6 port- infections (combinations with migrations of the band excluded), 14 port-rotations and 2 port-penetrations. Port breaks were seen in 3 patients, only during 2001, caused by a new port system of the Lap-Band. This system was eliminated from the market within a short time. Four port-infections were seen during the first 87 surgeries. Thereafter, we changed the technique, so that we added standard single-shot antibiotic prophylaxis and drainage of the port-layer. In the following years, we did not have any port infections until we started the study with the Heliogast band. Due to subcutaneous placement and wound-disruptions or tube-breaks, two cases of port-infections occurred during 30 Heliogast procedures. Figure 2. Distribution of complications and revision surgery from 1994-2002. 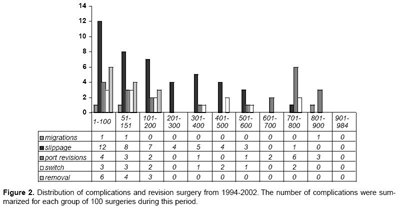 The number of complications were summarized for each group of 100 surgeries during this period. 1) During the learning curve, more band removals were performed. 2) Migrations of the band seemed to be related to the learning curve (probably damage to the gastric wall). 3) The rate of slippages was 17% in the first 100 procedures and dropped to 0% in the last 300 procedures. 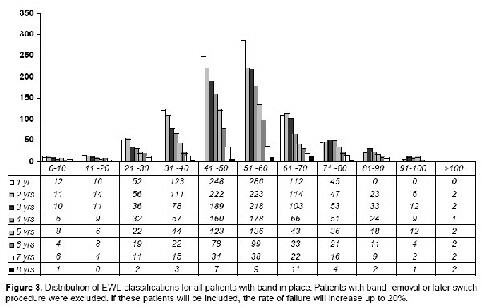 The median slippage rate of all adjustable gastric banding (LAGB)s was 3.6%. The change in band placement played an important role. 4) Port infections (without combination with migration or erosion) occurred in 4% during the first 100 LAGBs. After changing the management, port infections were seen in the Heliogast® series only. The median rate was 0.6%. The mean BMI of all patients fell from 46.8 to 34.0 kg/m2 within 1 year. After 3 years, BMI fell to 32 kg/m2. The median BMI of the first 100 patients with a band in place was 32 kg/m2 after 8 years. Distribution of %EWL at 8 years is shown in Figure 4. Mild esophageal dilatation was noted in 24 patients on GI series, when compared to the preoperative baseline study. It was uniformly associated with excessive stomal restriction. All these patients were completely asymptomatic, and this observation was made only as a result of a routine barium evaluation. In 18 patients, removal of 0.5 to 2.0 ml of fluid from the band resulted in immediate reduction of the dilatation. The other 6 patients were reluctant to have their bands loosened, because they had satisfactory weight loss with no symptoms. Reflux symptoms had been present in 68% of the patients preoperatively. After adjustable gastric banding (LAGB), the reflux symptoms disappeared, but in 4% of patients without preoperative symptoms, these symptoms occurred, caused by stasis. After removal of fluid from the system, the symptoms disappeared, but weight gain followed. Figure 4. 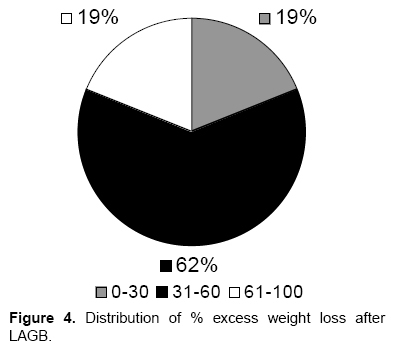 Distribution of % excess weight loss after LAGB. Prior cholecystectomy had been performed in 124 patients (12.6%), but 181 patients showed symptomatic cholelithiasis at the time of adjustable gastric banding (LAGB), so that we performed laparoscopic cholecystectomy during the LAGB. Of 679 patients with remaining gallbladders, 86 (10.7%) developed gallstones with clinical symptoms requiring cholecystectomy during or after the weight loss. Ultrasound examinations were available in only 376 patients, so that data on gallstone incidence could not be evaluated. QOL was studied 2 and 8 years after LAGB. Using the SF-16, the changes were small; however, with BAROS and modified QOL-Index, a stable improvement was found. Of the 678 potential fertile women (age 18-51), 21 completed 25 pregnancies as of July 2002. Two pregnancies occurred after tubal ligation: one ectopic pregnancy and one producing a full-term infant. Three women had first-trimester miscarriages, and two had elective abortions. None had complications related to obesity. There were no reports of diabetes, hypertension, neural tube defects, or eclampsia. Among 18 deliveries, 15 were vaginal and four were caesarean (one urgent for decreased fetal heart rate, three for cephalopelvic disproportion, and one repeat caesarean for twins). All pregnancies were full-term, and all fetal weights were normal. The mean birth-weight was 3,680 g (range 2,385–3,989 g). Three women had two pregnancies each during the study. Eight women had their first pregnancies, although all women had previously tried to conceive at heavier weights. These eight women lost between 12.4 and 48.4 kg (mean 28.6 kg) over 6 months to 2.5 years before becoming pregnant. Eight women gained approximately twice the weight that is recommended for women of normal weight during their pregnancies. Patients with the most weight gain (one case with 46 kg) had no fluid in their adjustable bands during pregnancy, and therefore no restriction of their food intake. Only two women required removal of fluid from the band for nausea and vomiting (one had a spontaneous abortion). The other 16 women who kept the diameters of their bands constant during gestation had 2.5 to 3.2 ml in their bands, resulting in three women losing weight (1.2 7.6 kg) and nine gaining weight (3.2-46.0 kg) during their pregnancies. Adjustment of bands consistently relieved nausea and vomiting when they became medical concerns. The changes in body weight during pregnancy and 6 months after were excluded from EWL and BMI evaluations for the laparoscopic adjustable gastric banding (LAGB) series. Plastic surgery has been recorded in 123 patients at a mean time of 22.2 months after laparoscopic adjustable gastric banding (LAGB). In two cases, the port- and tube-system were damaged during abdominoplasty; after weight gain of 14 kg and 26 kg, a new port-system was implanted and the weight curve normalized again. The problem with the retrogastric placement of the laparoscopic adjustable gastric banding (LAGB) was early pouch dilatation and gastric slippage. Therefore, we developed the two-step technique, which combines the pars flaccida and perigastric placement.2 The new technique has been able to prevent posterior slippage.3 The frequency of slippages decreased from 17% within the first 100 patients to 0% in the last 400 LAGBs. The operating time decreased from 1994 to 1997. After introduction of the two-step technique, a slight increase in operating time was noted, but thereafter the time decreased to a mean skin-to-skin operating time of 45 minutes. The mortality and the conversion rates have been zero. The morbidity rate has been 4.2%. Major complications requiring reoperation were seen in the first series of 400 patients. The frequency is comparable to other studies.4,5 In contrast to Favretti et al,4 we have performed band removals in cases of major complications, but not in cases of psychological intolerance. Gastrointestinal side-effects of the food restriction were not included in the morbidity rate. The percentage of recognized GI side-effects increased with increasing time after surgery. QOL-indices dropped from 92.5% (acceptable, good and excellent) after 2 years to 72.3% after 7 years. Laparoscopic adjustable gastric banding (LAGB) has less weight loss than RYGBP or BPDDS. However, follow-up of 301 patients at 6 years demonstrated that %EWL was good (31-60) and excellent (61-100) in almost 81.5% of patients (Figure 4). These data are comparable to other studies from Europe, Israel, Australia and Mexico.4-6 The number of patients dropped at 7 years to 159 and at 8 years to 42, but the weight loss data and the success rate appear to be constant. The results of U.S. studies have to be reviewed in the future. Looking at our own results during the learning curve (from numbers 1 to 100), we can expect better results in the U.S. series soon. The laparoscopic adjustable gastric banding (LAGB) has complications, but less than other bariatric operations. Slippage was a problem with laparoscopic adjustable gastric banding (LAGB) in the beginning, especially in the retrogastric technique of band-placement. After introducing the two-step technique, the rate decreased to <3% in published series, and posterior slippage was not seen. In cases of anterior slippage, the band can be corrected easily by the pull-through technique. Port-related complications occurred in <5%. The increase on port problems in 2001 was due to 6 rotated ports of the Heliogast system. The break of the port-system (Lap-Band) in 2001 was caused by a new port-system, which was eliminated from the market in 2002. Pregnancy after laparoscopic adjustable gastric banding (LAGB) has been safe. Most patients do not require removal of fluid from the band. Patients with no fluid in their bands during pregnancy had the most weight gain, due to no restriction of their food intake. Women require removal of fluid from the band only with nausea and vomiting. The adjustability of the band allows options if nausea and vomiting, weight loss, or inadequate fetal growth become concerns. Normal obstetric care with assessment of fetal growth should be carried out. Pregnant women who have had restrictive operations took prenatal vitamins. Improvement in QOL has been correlated with the degree of weight loss. Laparoscopic adjustable gastric banding (LAGB) is the least invasive bariatric operation with a very low operative risk. The two-step technique, as used here, results in only rare slippages. Esophagogastric placement has been found to lead to more frequent esophageal dilatations.12 The EWL has been good or excellent in more than 92% of the patients, in long-term follow-up over >8 years. Laparoscopic adjustable gastric banding (LAGB) being a restrictive procedure requires a degree of patient cooperation, including major modifications in life-style and eating habits.13,14 This often requires professional support by the multidisciplinary center. This center enables the selection and preparation of patients for surgery, provides support shortly after surgery, and deals with problems that may arise during follow-up. Conscientious follow-up is a key to success for LAGB.